By closing the bank accounts of these groups, HSBC appears to be acting where governments and parliamentarians have failed. The authorities have not, in fact, just failed; they have colluded. The bank simply stated that to continue providing services would be outside the bank's "risk appetite." In response to enquiries, the bank simply stated that to continue providing services would be outside the bank's "risk appetite." Just a few weeks previously, HSBC also closed the accounts of the Ummah Welfare Trust, a leading British Islamist charity that has previously partnered with the Al Salah Islamic Association, described by the U.S. Treasury Department as "one of the largest and best-funded Hamas charitable organisations in the Palestinian territories." Senior Hamas officials have confirmed that Al Salah is "identified with us." Anas Al-Tikriti, a senior member of the Muslim Brotherhood in Britain, had his bank account, along with that of his wife and two children, shut down by HSBC. Tikriti has been described as "one of the shrewdest UK-based Brotherhood activists … [who] has sought to persuade Western governments that they should fund Brotherhood groups as moderate alternatives to al-Qaeda." Tikriti is also a vocal supporter of the Palestinian terrorist group Hamas, and he has regularly hosted a program on the Arab TV satellite station, Al-Hiwar, founded by Azzam Tamimi, Hamas's "special envoy" to the UK. Tamimi, in 2004, told the BBC that he would become a suicide bomber if he "had the opportunity," and described self-sacrifice for Palestine as "a noble cause." Anas Al Tikriti (far left), a vocal supporter of Hamas, meets with President Obama. In an interview with the Muslim Brotherhood's official website after the 2003 invasion of Iraq, Tikriti affirmed "the right of the Iraqis to engage in legitimate resistance against foreign occupation." He also has stated that the decision by the Muslim Council of Britain to boycott Holocaust Memorial Day was a "principled stand." 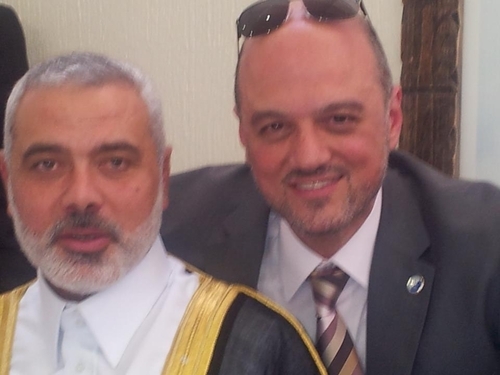 Anas Al-Tikriti (right) with Hamas leader Ismail Haniyeh. 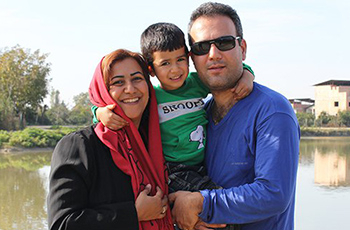 In response to HSBC's closure of his bank account, Tikriti claimed that, "HSBC has targeted my family because of my activity in defence of Gaza against the barbaric aggression of the Zionists" and because of his efforts to "oppose the military coup in Egypt." While many would dispute Tikriti's conclusions, his instincts might be right. 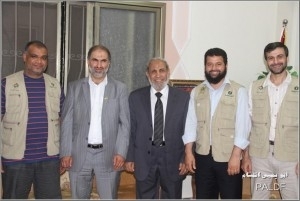 The one thing that connects Tikriti with the Cordoba Foundation, the Finsbury Park Mosque and the Ummah Welfare Trust is evidence of their support for the Muslim Brotherhood and the designated terrorist group, Hamas. The Cordoba Foundation, which Tikriti heads, has been described by Prime Minister David Cameron, as a "political front for the Muslim Brotherhood." In 2009, Cordoba co-sponsored an event organized by Cageprisoners, a pro-jihadist group, which featured as a guest speaker Anwar Al-Awlaki, who later became a senior leader of Al-Qaeda in the Arabian Peninsula, before he was killed in a U.S. drone-strike in 2011. The Cordoba Foundation also works closely with the Emirates Centre for Human Rights, whose website was originally registered to Tikriti's wife, Malath Shakir, whose bank account was also shut down by HSBC. According to UAE media, the Emirates Centre for Human Rights is part of the global Muslim Brotherhood network. The Finsbury Park Mosque was once a much easier target for criticism. Ten years ago, the hook-handed Imam of the mosque, Abu Hamza -- recently found guilty of eleven terrorism charges after a five-week trial in New York -- was arrested on terrorism charges. After his arrest, however, the British government, eager to rid the Finsbury Park Mosque of its pro-terror reputation, passed control of the institution to the Muslim Association of Britain [MAB], one of the better-known Muslim Brotherhood fronts in the UK, and one with which Anas Al-Tikriti was once closely involved. Tikriti's lobbying efforts for the government to embrace Muslim Brotherhood groups as "moderate" alternatives to more overtly terrorist organizations appeared to have paid off. "Oh honoured brothers, the Palestinian cause is not a struggle on borders or on land only. Rather, it is an absolute clash of civilisations: a satanic programme led by the Jews and those who support them and a divine programme carried by Hamas and the Islamic Movement in particular and the Islamic peoples in general." To run the Finsbury Park Mosque, the MAB appointed directors such as Mohammed Sawalha, a Hamas official described by a Brotherhood website as being "responsible for the political unit of the international Muslim Brotherhood in the UK." Sawalha is also "said to have masterminded much of Hamas's political and military strategy" out of London, as reported by the BBC. Mohammed Sawalha (middle) with Anas Al Tikriti (to his left). Finsbury Park Mosque continues to promote the Muslim Brotherhood preacher, Jamal Badawi, who has described suicide bombers and Hamas terrorists as "freedom fighters" and "martyrs." Badawi also advocates the right for men to beat their wives, if they show "disregard for [their] marital obligations." Finsbury Park Mosque still enjoys strong support from the local Council and the Metropolitan Police, both of which have sponsored events at the mosque with the support of the World Association of Muslim Youth [WAMY], a Saudi group that is a prolific publisher of anti-Jewish and anti-Shia material. WAMY is accused by a number of governments of funding terrorism. Kozbar, far-Left, stands next to a British police officer at an event in the Finsbury Park Mosque. Both are in front of a poster advertising WAMY, a Saudi group accused of financing of terrorism, which sponsored the event. Likewise, the Ummah Welfare Trust has enjoyed the support of MPs; and the Cordoba Foundation has also received government funding through the Prevent scheme, a fund established by the previous Labour government to combat extremism. 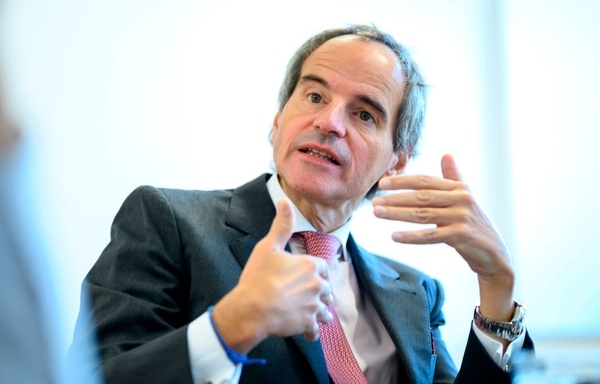 The biggest question now about HSBC's actions is "why?" Some observers have suggested that the HSBC's decision in 2012 to hire Stuart Levey, the former under secretary for terrorism and financial intelligence, might have something to do with it. Others have suggested the possibility that the British government's review into the Muslim Brotherhood, which the Prime Minister is due to hear during the summer recess, might be already having some effect. On the face of it, it seems unlikely that the government would pressure HSBC to shut down Muslim Brotherhood bank accounts while allowing the British police to fund and sponsor Finsbury Park Mosque, one of the Brotherhood's most important institutions. But the coalition government, much like the Labour government that preceded it, seems always to have embraced a contradictory approach in its efforts to confront British Islamism. The present government, for instance, managed to declare the Islamic Shakhsiyah Foundation a "Hizb ut-Tahrir front" and at the same time provide it with £70,000 of taxpayer monies. In addition, after the announcement of the Muslim Brotherhood review in March 2014, the Foreign Office revealed that its advisory group on "freedom of religion" was to include a leader of the Muslim Brotherhood, Tariq Ramadan, as a board member. Regardless of these apparent contradictions, HSBC's decision to close down these bank accounts is welcome. For far too long, Muslim Brotherhood groups in Britain have escaped censure in spite of their promotion of extremism and their connections to terrorism. Even if the government is dithering, at least the private sector is acting. "who note that the Cordoba Foundation and the Finsbury Park Mosque have enjoyed strong political support in the past." If I'm not mistaken, the Muslim Brotherhood had the "London branch" of it's organisation based above a takeaway in London and recently moved, I think to Austria? ...fries with that? Absolute suicide for England, craven cowards we have for leaders, too busy trying not to offend somebody, always apologising, always sorry for something, slithering along on their bellies like a whupped puppy. Sickening. It is high time these Islamist terrorist organisations such as the odious Moslem Brotherhood that seem to be the darlings of our "Progressive" antisemitic governments were taken down a peg or two. It is about time that the people of this country wake up and see what is happening in this country. Hat off to HSBC . Good News for Israel from the HSBC. The Hong Kong Shanghai Banking Corporation is an anglo-chinese bank and always has been. It was the financing tool that the Overseas Chinese and the English merchant traders established to make their business in the Far East mesh with business in their markets in Europe and the USA. It eschewed politics as much as possible because politics mean governments and governments make more snafus than business. It became and still is the heart of Pacific and Indian Ocean trade in our world today. HSBC is a group that is interested in money and finance for business and it does not care what business you are in. If it sells, it is good. It had to adopt a ledger approach to depositors and borrowers and it was very successful with that since it dealt with all kinds of cultures and mores, not only in Asia but in the rims of the ocean areas that were their world, including San Francisco, California. HSBC will eschew Islamic accounts that are fusing religion in their business. It is what they have done always and if they are cracking down hard now, it is because they know more about what is going on than governments. especially ours in Washington, DC. Jews can take heart in this forward step by HSBC. The Islamists in their area must be losing place so perhaps the trend is against everything the USA seems to stand for now. HSBC led in the acceptance of China's business revolution of the last 30 years and they were right. That is good omen for now in this terrible affair in the Mid East! Delighted to read that HSBC has closed major Islamic accounts and horrified to hear of Government support of Islam, also police support. No wonder our nation is in such a state in every way. We have turned completely from morality. No wonder people have stopped going to the polls. We no longer have anyone of integrity to vote for. Wondering here if enough attention is being aimed at the complicated Brit history of dual relationships during the Mandate period. Wondering if this is a public Private versus Government position straddling that sharp edged fence of playing a few here and there, against a few here and-way-over-there-just-out-of-sight. Didn't the Brits make contradictory territorial promises to both the Jews and the Arabs? The very idea of a Brit police officer [Constable?] posing like that shown with those prominent Islamists is nothing if not cringeworthy; and, the Brit Government cash contributions to these smiling' Islamists seems to smack of Jizya. In other words, this is probably only part of the story. Lets hope that our Brit cousins aren't going to be "hoist on their own petard". They're playing with fire, literally. This is great news; definitely a good start. I can only hope the sentiment and corresponding action spreads. Probably had something to do with all those fines they had to pay previously. This article shows in uncertain terms the collusion of British Government bodies with subversive & terror supporting elements. Hamas, the Muslim Brotherhood & a host of other more like criminal groups that have unchallenged path in the British system in spite of their known destructive roles they play. It probably happens in the rest of Europe as it is not hard to see why the flare up of anti Semitism, it points to the freedom the groups of like Hamas, the Muslim Brotherhood to play incitement without fear of consequences. To HSBC kudos for having enough integrity doing the right thing. Pity, same can not be said for the authorities. Keep up your excellent work. I have no words to express how grateful I feel when I open your column, read and share with my family and friends your daily information. I know that I can trust your judgment to impart the truth. Thanks so much for the quality and high standards that is Gatestone. At last there is an awakening among financial institutes to what is happening in the "West" from subtle political invasion to bold financial manipulation from Islamist terrorism. HSBC has acted where politicians have failed. Good on you HSBC. You are an excellent example of long-sightedness and political awareness. Wake up Brits. Your country will be taken over by jihadists if you do not act now ! As soon as I am able, I will be opening an account at my local HSBC. It isn't millions, but it is a show of support and approval for their decisions. Let us all show HSBC we support them and we advise our authorities to protect HSCB. Of course we know that the Saudi regime is actively (though very covertly) working to bring down the West, and they have limitless amounts of well laundered money sloshing about in their bank accounts and vast business interests. Nothing will ever be done to upset these treacherous people, and our political and financial elites will continue to grovel to them. They are sponsoring not only terror organisations but also mega Wahabi mosques, and soon every town in Britain will have one. They are no more friends of the West than are Al Qaeda, Hamas or Hizb ut Tahrir, they are playing the long game that leads to the destruction of democracy and world wide sharia. Welcome news,especially after the seemingly endless-and continuing-list of financial jiggery pokery and misdemeanours in the banking/finance world. 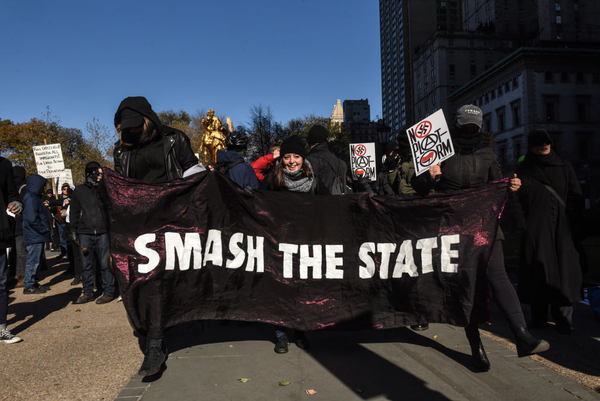 My belief, as an increasingly bewildered and disillusioned Briton, is that the UK establishment -- police, government, educational bodies and media -- is suffering from a particularly insidious form of cognitive dissonance: the symptoms are made clear in the article. We have rolled over and taken leave of our collective senses.